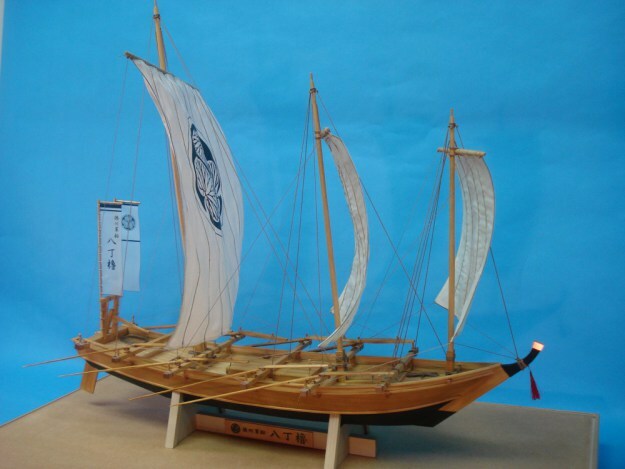 The latest Japanese boat model display by ship modeler Clare Hess is now on display at San Francisco’s Japan Center. 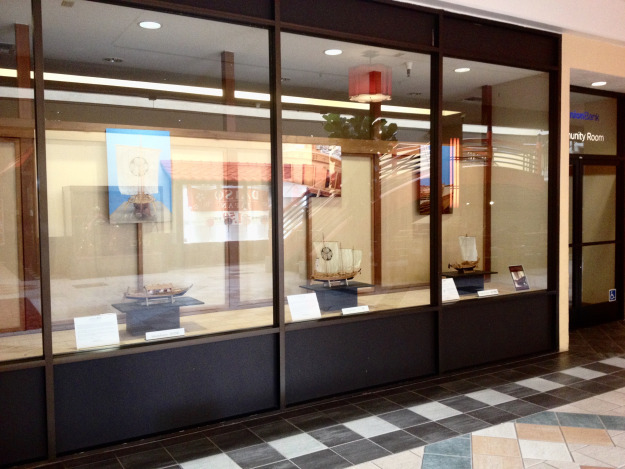 The display is located in the window of the community room of Union Bank, which is in the East Mall building of the Japan Center Mall in San Francisco. Three models are featured this time around, making for a much more complete display than the last two, which consisted of only two models. The models are shown below. Higaki Kaisen – A Japanese coastal transport from the Edo Period. 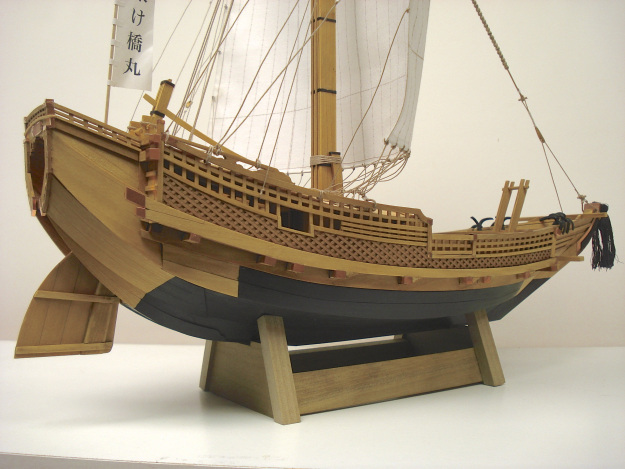 This sailing ship operated in vast numbers between Osaka and Edo (now Tokyo), maintaining the flow of consumer goods which supported the growing cities economy. Yakatabune – These houseboats were initially owned by nobility for leisure use, but were very popular during the peace and growing prosperity of the merchant class. During the Edo period, it became common to rent a yakatabune to entertain guests or for viewing the fireworks at festival time or cherry blossoms in the Spring. These boats became a cultural symbol of growing prosperity. This week, I installed my latest display of models of traditional style Japanese boats at the Japan Center in San Francisco. If you haven’t seen it before and are in the area, this is a good display to check out. This time around, I added a third model to the collection, my Yakatabune model. So now, there is the Higaki Kaisen (1/72-scale), Hacchoro and Yakatabune models (both 1/24-scale). All three models were built from kits by Woody Joe of Japan. The display will run from now through all of November and December in the window of the Union Bank community room, which is in the East Mall building. 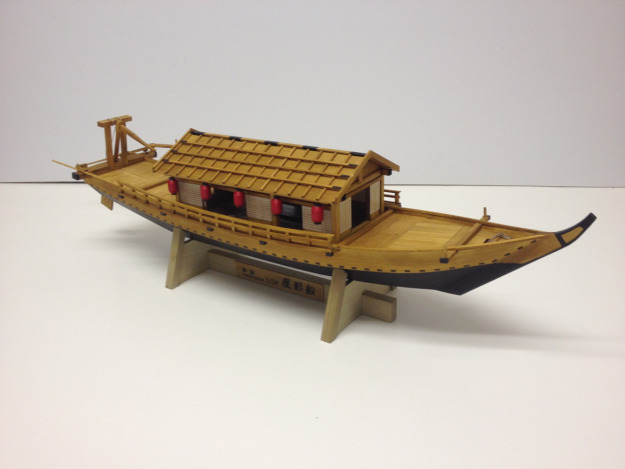 This entry was posted in Clare Hess, News, Ship Modeling and tagged Traditional Japanese Boats, Wasen by catopower. Bookmark the permalink.